Classic Garden Home. A 2 bedroom, 2 bathroom bungalow with a private pool and located in a great village. It has off road parking and some versatile outdoor areas. Inside there is a fitted European kitchen and a large living area. There is a small terrace ioff the master bedroom. Each room has air conditioning and the property has been fully furnished. The village also a Club house with communal swimming pool, green areas and Gym all just a 1 minute walk away!! 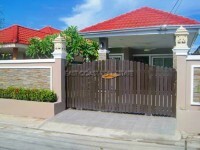 The development has 24 hour security and is well maintained. Available now for sale in company name ownership.